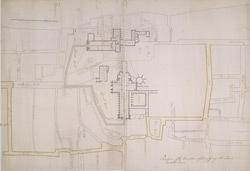 This manuscript plan shows the route of the procession of George II's Coronation, from Westminster Hall to the Abbey. George II's reign was dominated by the Jacobin conflict, and his reign was threatened in 1745 by Charles Edward Stuart, the Young Pretender, who landed in Scotland. The Jacobite threat came to an end when Charles was defeated at the Battle of Culloden in April 1746. The country prospered greatly during George II's reign, with the coal and shipbuilding industries becoming more productive, an overall growth in the population, and the establishment of British control in Madras and Bengal.